Madam Chairwoman of the Supreme Court! Representatives of the diplomatic corps and dear guests! 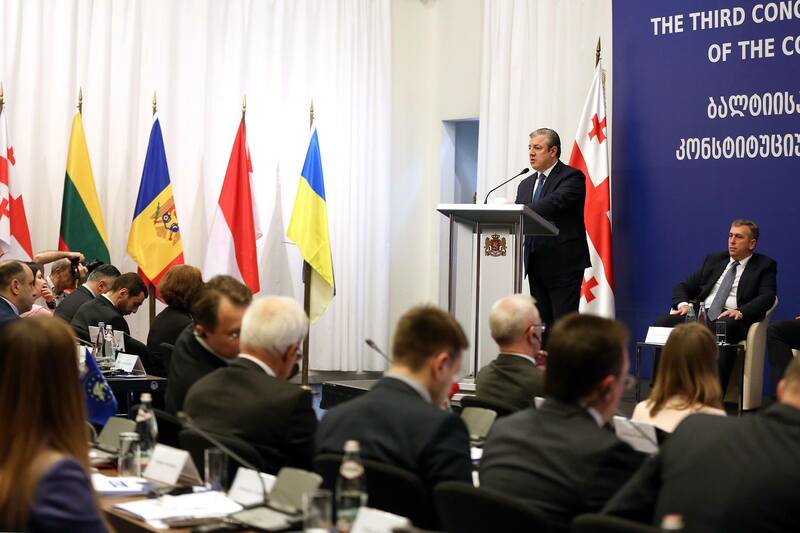 It is a great honor to host the Congress of the Association of Constitutional Justice of the Countries of the Baltic and Black Sea Regions on the 100th anniversary of the declaration of the first Georgian Republic and the 97th anniversary of the adoption of the first Constitution of independent Georgia. We welcome the fact that the association's member states have united around common goals which cover promoting respect for human rights and fundamental freedoms, support for the independence of constitutional courts, the introduction of the principle of the rule of law, and experience exchange between the association's member states. At the same time, the constitutional courts of the member states focus on the empowerment of constitutional justice in their respective countries, the promotion dialogue on issues pertaining to constitutional justice, and on the deepening of bilateral cooperation in this direction. I must emphasize that Georgia's Constitutional Court is a full member of the European family, despite the fact it is among the courts of so-called emerging democracies. It is confirmed by the international activities implemented by in the recent years. In the past three years, in 2014-2017, the Constitutional Court of Georgia chaired the Conference of European Constitutional Courts, a pan-European forum that brings together the European countries' institutions administering constitutional justice. I strongly believe that the international recognition of the work of Georgia's Constitutional Court will promote the cementing of our country's success and the development of Georgia's state system grounded in democracy and the rule of law. The role of the Constitutional Court of Georgia in the introduction of legal culture and civic values in society is undoubtedly very important. On behalf of Georgia's government, I would like to reiterate my respect for the principle of judicial independence. As we follow the best European traditions, our state political system is maximally interested in putting in place every condition-legislative, administrative, or material guarantees-to enable every judge to carry out their work freely and uninterruptedly. To this end, we are actively working, including in cooperation with the Constitutional Court, to ensure their institutional empowerment. At the same time, in line with the constitutional principle of the rule of law, we pay due respect to the work of the Constitutional court as an integral part of the functioning of a democratic system and a mandatory precondition of its future development. As you know, Georgia aims to build a democratic and developed European state, and this goal is the cornerstone of the process of reforming and modernization in our country. We appreciate prospects of deepening cooperation with our partners, and we are trying to make use of their support in order further to strengthen the country's democratic institutions. Today, I avail myself of this opportunity to thank our partners, friend nations, for their contribution to the development of our country's judiciary. In this context, I would like to point out that the Constitution of Georgia is the precondition and guarantee of our country's democratic development, and its new version ensures its compatibility with the highest European standards. As a result of the implemented changes, today we have a flawless constitution which ensures stability and pluralism in the country, and puts in place a clearly defined principle of checks and balances. Today, ensuring observance of the Constitution's requirements and the strengthening of government stability is especially important to our country on its path to democracy and European integration, which Georgia's Constitutional Court guarantees. In this hall, I see those who, since the restoration of Georgia's independence, have stood at the helm of the independent Georgian judiciary, leading both the Supreme Court and the Constitutional Court, and I would like to reaffirm my gratitude for their excellent work. In conclusion, I am convinced that this congress will lay the valuable foundation for the development of institutional dialogue between the Georgian and European courts at the national and regional levels alike, this way boosting the alignment of our country's judiciary with European justice. Thank you very much for your attention. I wish success to the congress.